The Hollow City is a city in central Coldharbour. It was once an Imperial settlement in Tamriel devoted to Meridia, and her power continues to shield it from the influence of Molag Bal. The Hollow City sits in between the three Subzones in Coldharbour. A few points of interest are located within the city, and thus outside of any of the Subzones. Cicero's Food & General Goods — A store run by Cicero Eudoxius and Gulza, a merchant and a grocer, located in the Hollow City. Mixed Results — An alchemist store run by Calanor located in The Hollow City. The Shining Star — A tavern in the Hollow City. The Hollow City Objective: Help restore the glory of the Hollow City. 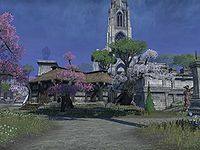 As you progress through the quest The Army of Meridia, the people you have helped move into the city and begin to restore it. The Fighters Guildhall opens up when you rescue King Laloriaran Dynar. The Mages Guildhall opens up when you rescue Vanus Galerion. The shops and services all open up once the objective Restore the Hollow City is complete. This usually happens after rescuing around thirteen people[verification needed] through side quests and from the wilderness of Coldharbour. The homes open up as and when the related characters move in to them, as detailed below. Lady Clarisse Laurent, Telenger the Artificer, Kireth Vanos and Raynor Vanos move into the Consultants' House just inside the west gate once they are rescued from the Library of Dusk. 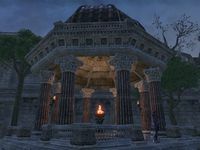 Treeminder Xohaneel's scholars, or An-Jeen-Sakka and his warriors, can be found in the Argonians' House, depending on who you side with during Wisdom of the Ages. Note that Xohaneel herself doesn't actually show up if you side with her. Faraniel from Into the Woods can be found on the western bridge. Note that if you sided with the lamias, she will only appear if you completed the optional objective and did not kill any of the Shadow Walkers. Tzik'nith and the lamia from An Unusual Circumstance appear just north of the lake in the west of the city, by the south wall of the Consultants' House. They only appear here after Restore the Hollow City is complete. The survivor of The Soul-Meld Mage can be found in the Dark Alchemy Lab east of the stables. Malkur Valos, Tarrami, Dithis Romori and Denthis Romori can be found at the Library near the Mages Guild District once they are rescued from the Court of Contempt. Darien Gautier, Valorone, Ferva Hloril, Hahnin, Egarfin the Bold, and Holgunn are found in the wilds by Cadwell and Honor, and will be present in the Fighters Guild when you arrive with King Dynar. Vosh gra-Kreeg, Candion, Aleeta and Messenger Narfild Deepcrag arrive at the Fighters Guild when the shops and services open up. Skordo the Knife, Vikord Skullcleaver and Sinfay will arrive at the Fighters Guild after escaping from the Tower of Lies. Nalia, Manis Dral, Gabrielle Benele and Walks-in-Ash will have made their way to the Mages Guild by the time you arrive with Vanus Galerion. Bendralas, Deep-Thoughts, Ronarith and Glendora arrive at the Mages Guild when the shops and services are restored. If they are rescued from The Endless War, Juline Ginis, Mim and Relmus will be escorted to the Library near the Mages Guild by Cadwell. Angof the Undying, High Kinlady Estre or Thallik Wormfather can be found in the House of Darkness if they escape from the Cliffs of Failure. They can also be found in or around The Shining Star. Patrons of The Everfull Flagon will relocate to The Shining Star once they are weaned off their Special Blend. The village leaders from Soul Survivors can be found near the tavern if they escape from the Village of the Lost. 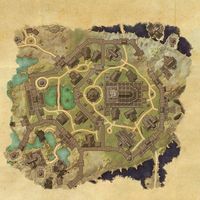 The Hollow City Wayshrine is located in the west of the city, near the pond and next to the exit to the Shrouded Plain. Unusually, the wayshrine glows with an orange flame.